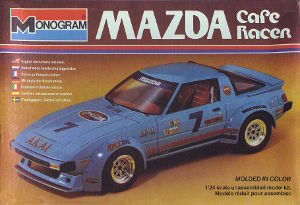 This kit was first released in 1981 and is based on the street version with added race features. The same high level of detail as with the street kit, combined with being the only 1/24 model kit of a left hand drive Rx-7 racer make this a very sought after model (it took me more than 12 years to find one, thanks Jim !). The decals (link to 300dpi scan of actual decal sheet) are based on a Racing Beat owned car that competed in IMSA GTO class in the early 1980ies. The 2017 Revell release of the Monogram Rx-7 kit contains all additional racer parts that came with the CAFE racer kit.